Did you know “Sally” is from Hebrew origins and means Princess? Yep, that’s me – royalty! Though I’m the good kind that doesn’t put on airs. I am so soft and I’m friendly to everyone. 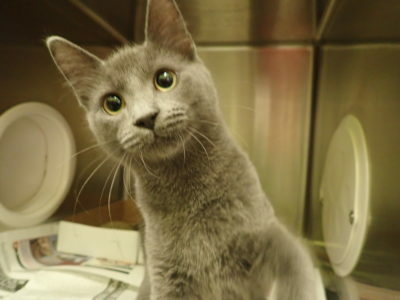 They say gray cats are very fun-loving – that’s me, too! Right now I’m with my brother Jack (as in Jack Black) and we keep each other company. If you’re looking to start your cat family, why not give us a go? But if you have to choose just one, we’ll understand. Come see us in Cat Room A – we’re quite cute! Click above for video - Sally practices the nose bump skill.